Malaysia’s ties with the Gulf Cooperation Council (GCC) states deepened substantially during Najib Razak’s tenure as prime minister (2009-18). Trade grew and further diversified beyond energy to sectors such as agriculture, finance, real estate, and tourism. Although behind China, India, Japan, and South Korea in terms of importance to the Gulf sheikdoms’ eastward geo-economic pivot, Malaysia nonetheless has played a significant role in their 21st century ‘Look East’ orientation. For decades Malaysia’s Islamic identity has strongly factored into the latter’s ties with GCC members. Kuala Lumpur has long engaged the Arab Persian Gulf monarchies closely on issues of major ideological and geopolitical importance to the wider Arab/Islamic world from the Soviet Union’s invasion of Afghanistan to the unresolved question of Palestine. Today, in the face of common threats from radical Islamic terror organizations such as Islamic State and al-Qaeda’s various offshoots, Malaysia and the Arabian Peninsula’s conservative sheikdoms have largely seen eye-to-eye on issues pertaining to extremist threats. Malaysia, like the GCC countries, belongs to the Organization of Islamic Cooperation and the Islamic Military Counter Terrorism Coalition (IMCTC). In February and March of 2016, Malaysia participated in North Thunder, which was arguably best described as the first multinational exercise held by IMCTC, which was then called the Islamic Military Alliance to Fight Terrorism (IMAFT). The previous year, Malaysia had joined the Saudi-led military campaign against the Iranian-sponsored Houthi rebellion — two months after Riyadh’s coalition entered Yemen. On May 10, 2015, Saudi media reported on Malaysia becoming the 12th state — just after Senegal — to join the Riyadh-led military coalition in Yemen. Yet soon after, Malaysia’s defense minister Hishammuddin Hussein took to Twitter to clarify that his country would not be deploying its military forces to Yemen, only to Saudi Arabia itself for “humanitarian” and “evacuation” purposes. Ultimately, Malaysia’s joining the Saudi-led coalition in Yemen served primarily symbolic purposes, namely to add to the number and diversity of states belonging, at least nominally, to the multinational force fighting the Houthi rebels. 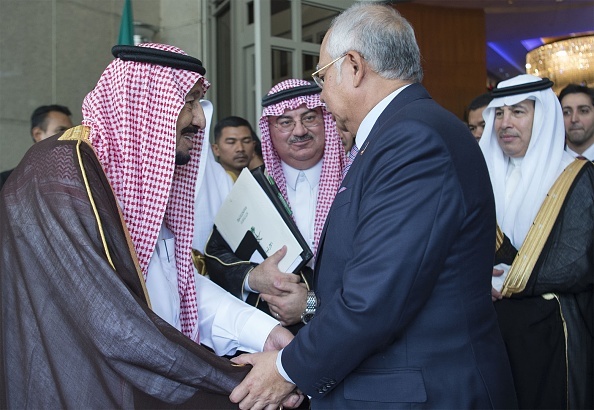 Nonetheless, the fact that Malaysia was technically a member of the Riyadh-led multinational Sunni force fighting in Yemen underscored Kuala Lumpur’s closeness with Saudi Arabia during Najib’s time in power. Islamic relief NGOs and foundations from the Arabian Peninsula have been intimately involved in Malaysia, further deepening Kuala Lumpur-GCC ties. The increased presence of charities such as the United Arab Emirates’ (UAE) Asian Muslim Charity Foundation and Qatar Charity have positioned the Arab Persian Gulf monarchies as increasingly influential in Malaysia’s education, social work, and disaster relief sectors. Saudi Arabia’s King Salman and Qatar’s Emir Tamim visited Kuala Lumpur during their Asian tours in March and October 2017, respectively. Additionally, King Hamad became the first Bahraini monarch to visit the Malaysian capital in April/May 2017. Last December, Malaysia’s former Prime Minister paid a three-day visit to Bahrain, becoming the first foreign leader to be conferred with the King Hamad Order for Development. Such high-level visits illustrated Arab Persian Gulf leaders’ keenness to cement their countries’ strong relations with Malaysia. For Kuala Lumpur, which has traditionally maintained solid ties with all Arab Persian Gulf states and Iran, the 15-month-old Qatar crisis has been unfortunate. Keen on remaining neutral, Malaysia has fully supported Kuwaiti efforts to resolve the dispute. According to a Malaysian diplomat posted to one of the GCC members, Kuala Lumpur’s position since the beginning of the row was that it was most in the interest of Persian Gulf security for the dispute to be resolved within the Council. Malaysia, like most Asian powers, supports a unified GCC and the ability to pursue deeper ties with all six members, thereby aiming to capitalize on the benefits that a more economically integrated Arabian Peninsula offers Malaysia and Southeast Asia as a region. The potential for the Gulf dispute to break out into a military confrontation is a concern that Malaysia cannot ignore. With vested interests in Persian Gulf energy supplies and in continuing coordination with all GCC states on security issues, any instability in the Arabian Peninsula constitutes a grave threat to Kuala Lumpur’s vital interests from the Malaysian perspective. Even if the GCC crisis does not escalate into a military confrontation, the persistence of the dispute will harm Kuala Lumpur economically. The dispute is likely to further delay the implementation of the Malaysia-GCC Free Trade Agreement (FTA), which, since the framework accord was signed in 2011, has been on the back burner due to the post-Arab Spring political volatility in the region and plummeting of oil prices. In fact, unless and until the Saudi/UAE-led bloc and Qatar can reconcile, the Malaysia-GCC FTA will simply not come to fruition. Far from condemning or isolating Qatar, Malaysian officials have continued to treat their Qatari counterparts as valued partners, including in the struggle against violent extremism. Along with Indonesia and Singapore, Malaysia was one of the stops on the Qatari emir’s Asian tour in the fall of 2017. With the Malaysian Prime Minister Najib, Emir Tamim signed bilateral memoranda of understanding in domains such as judicial cooperation, diplomacy, and education in October 2017, four months into the crisis. Malaysia’s Prime Minister praised the emirate’s contribution to international efforts to defeat the forces of violent Islamic extremism and radicalization, illustrating how the ATQ bloc’s narrative about Qatar being a state-sponsor of terrorism that must be isolated was not bought by Malaysian diplomats who, to the contrary, view Doha as a strong counter-terrorism ally and extremely important investment and trade partner. Soon after the Qatari emir left Malaysia, Qatar Airways announced its plans to commence direct flights from the emirate to Penang, which was the Qatari state-owned airline’s second Malaysian destination. Currently, Kuala Lumpur is concerned about pressures it may come under from the ATQ to distance Malaysia from Qatar, much like Saudi pressure on Kuala Lumpur to keep Iran at arm’s length, and thereby adding a further and, from their point of view, unnecessary layer of complexity to regional relationships. Doubtless, Malaysian diplomats will be closely watching how the Qatar-ATQ dispute, having entered its second year, evolves. Kuala Lumpur will be highly sensitive to moves by Riyadh, Abu Dhabi, or Doha that could threaten to escalate the tension potentially into a military confrontation, and further erode any remaining prospects for GCC reconciliation, which Malaysia and virtually all Asian powers strongly favor. Although lacking the means to engineer a reconciliation between the ATQ and Qatar, Malaysia is approaching the dispute cautiously to avoid appearing on either side. Yet a concern for Malaysia is that within the context of this zero-sum conflict, Kuala Lumpur could be, from the ATQ’s perspective, seen as taking a pro-Qatar position, given that Malaysian-Qatari relations have continued to grow despite the blockade. In the aftermath of Saudi-allied Prime Minister Najib’s surprising, yet decisive, defeat in the May 9, 2018 general election it is legitimate to question the durability of some of the linkages between Malaysia and Saudi Arabia and the UAE, which developed during the latter part of his nine-year premiership. Beyond Malaysia’s position on the Qatar crisis, other issues threaten to cool Kuala Lumpur’s ties with Riyadh and Abu Dhabi with the new Malaysian government now in power. The restarting of the probe into the misuse of funds linked to 1 Malaysia Development Berhad (1 MDB), a state-owned investment company established by Najib four months after he became Prime Minister in 2009, is a major headache for officials in Riyadh and especially Abu Dhabi who face the prospect of renewed investigation into entities and individuals linked closely to the affair. The close association of certain Emirati and Saudi entities and individuals with 1MDB that may come in for uncomfortably intense scrutiny now that Najib has been ousted from power. Allegations have swirled around 1MDB and Najib since the Wall Street Journal ran a series of investigative reports in 2015 that indicated that nearly $700 million may have been diverted from the fund into personal accounts linked to Najib. Although the Wall Street Journal and other media outlets kept producing a stream of allegations that kept 1MDB firmly in the public eye, it was assumed by many, including in Saudi Arabia and the UAE, that any investigations would be kept at bay so long as Najib remained Prime Minister — a calculation that led to a rude awakening after his shocking defeat in the May election. Reporting by the Wall Street Journal has indicated that Malaysian investigators had traced five separate deposits into Najib’s accounts, and that the two largest transactions were deposits of $620 million and $61 million in March 2013, which came from an entity registered in the British Virgin Islands via the Swiss-based Falcon Private Bank. Abu Dhabi’s Aaber Investment (itself majority-owned by the International Petroleum Investment Company (IPIC), also based in Abu Dhabi) had purchased Falcon Private Bank in May 2009. Yet another Abu Dhabi entity, Mubadala, absorbed IPIC’s interests in a May 2016 merger but has been struggling to sell Falcon because of nervousness among potential buyers about the bank’s exposure to further investigation for its alleged failure to prevent suspected money laundering associated with 1MDB. Other links with officials at PetroSaudi, a private oil company founded in 2005 by King Abdullah’s son, Turki, are also being probed, as are connections between Malaysian financier Jho Low and officials both in Riyadh and Abu Dhabi, which could cause additional concern if or when Jho Low is located by the Malaysian authorities. Another sign of a backlash against Najib’s government approach to the Persian Gulf came in June 2018 when Malaysia’s new Defense Minister, Mohamad Sabu, stated that the government would reassess his predecessor’s 2015 decision to station Malaysian forces in Saudi Arabia, ostensibly to assist in the evacuation of Malaysian citizens from Yemen. Sabu stated pointedly that the presence of Malaysian troops in Saudi Arabia “has indirectly mired Malaysia in the Middle East conflict” and argued that their withdrawal was needed to maintain Malaysia’s neutrality in regional affairs. Two months later, on August 6, 2018, Defense Minister Sabu, announced the immediate closure of the King Salman Center for International Peace (KCSIP) within the first 13 months of its launch, and the absorption of its functions into the Malaysia Institute of Defense and Security. KCSIP had been formed during King Salman’s visit to Malaysia as part of his Asia tour in February/March 2017 and touted as a critical component of both countries’ fight against violent extremism. Both the June announcement of a review of Malaysia’s military presence in Saudi Arabia and the August closure of an anti-terror center set up in Kuala Lumpur in the name of King Salman in 2017 suggest a profound reorientation of policy under the new government of veteran political leader Mahathir Mohamad that could cause ripple effects right across the western Persian Gulf. Looking ahead, although Malaysia wants to maintain fruitful relations with Saudi Arabia and the UAE, the new government in power in Kuala Lumpur is sending a clear message to Riyadh and Abu Dhabi that Malaysia places a high value on maintaining neutrality in conflicts and diplomatic crises plaguing the Arabian Peninsula in line with Kuala Lumpur’s traditionally non-aligned foreign policy. Hishamuddin Hussein, “No - only to Riyadh for Humanitarian / Evacuation ‘@bumilangit: Dear H2O, is it true that Malaysian sending troops to Yemen?” Twitter, May 10, 2015, https://twitter.com/HishammuddinH2O/status/597392358192197632. Hilman Latief, “Gulf Charitable Organizations in Southeast Asia,” Middle East-Asia Project (MAP), December 24, 2014, http://www.mei.edu/content/map/gulf-charitable-organizations-southeast-asia. “Malaysia rolls out red carpet for Qatar’s emir,” AP, October 16, 2017, https://www.apnews.com/ce65938042044de2a8589b3a0e8a0618. Kristian Coates Ulrichsen, The Gulf States in International Political Economy (New York: Palgrave, 2016) 140. Authors’ interview with a Malaysian ambassador in the Gulf Cooperation Council. Rupa Damodaran, “Malaysia-GCC trade deal on hold for now,” New Straits Times, March 1, 2017, https://www.nst.com.my/news/2017/03/216334/malaysia-gcc-trade-deal-hold-now. Bradley Hope and Tom Wright, “Malaysia’s 1MDB Fund Scandal Spreads to U.A.E.,” The Wall Street Journal, September 9, 2015, www.wsj.com/articles/malaysia-fund-scandal-spreads-to-u-a-e-1441755072.